What Is Clinique iD™: A first-of-its-kind custom-blend moisturiser that hydrates and treats your main skin concern, your way. You first choose your hydration base depending on your personal skin needs (oily, dry, normal), this will deliver 24-hour hydration repair plus pollution protection. You then pick out a Active Cartridge Concentrate to help deal with your skin concern. Each pump delivers 90% Hydration Base and 10% Active Cartridge Concentrate the Custom-Blend Chemistry Technology™ delivers optimised results with every pump by freshly combining the precise dose of concentrated actives and base for the ultimate customised skin care experience. 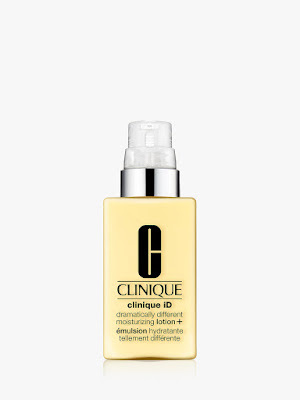 What It Is: A first-of-its-kind custom-blend moisturiser that hydrates and treats your main skin concern, your way. Skin Type: Oily to Combination. Skin Type: Very dry to dry combination.